While LG are definitely putting their best foot forward when it comes to fronting OLED as a technology, it’d be a mistake to think they’re putting all their chips on OLED TVs. After all, in reality, LG do still make and sell a lot of traditional LCD LED TVs. And for those unwilling or unable to make the jump to OLED just yet, LG’s SK85 Super UHD TV is a richly-realised, albeit utterly-conventional, alternative. Still, even if it doesn’t quite have the awesome spark of OLED behind it, the home entertainment experience this TV (which we reviewed alongside the LG SK9Y soundbar) affords is far from an unwelcome one. 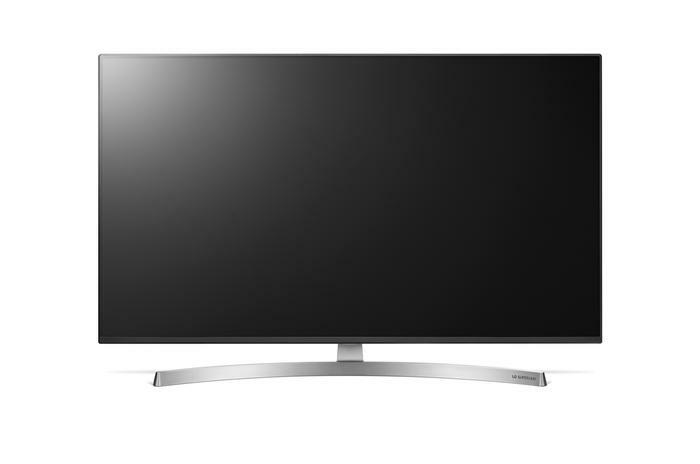 When someone says the words ‘LG TV’ to you, the SK85 Super UHD TV is probably the real-life product closest to the image that’s conjured in your head. Whether it’s sitting on the display shelving of your nearest JB Hi-Fi store or neatly assembled within the confines and comfort on your home, the LG SK85 comes across as one of the “most LG” TVs that LG have ever put together. 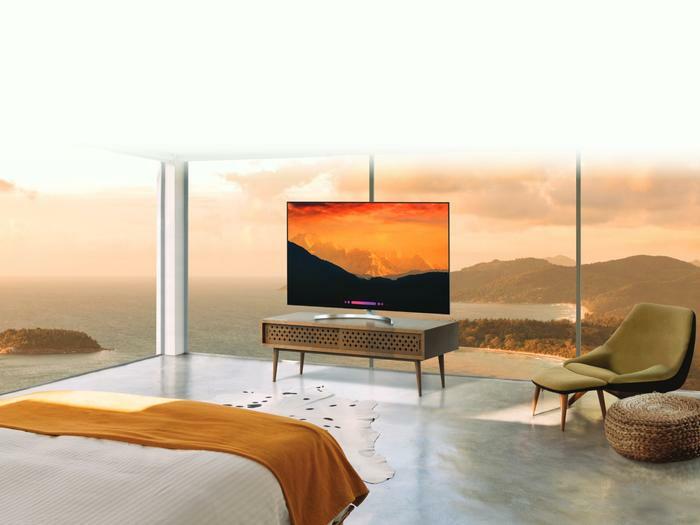 Available in 55 and 65-inch variants, the SK85 comes with a curved prong-style stand and a bevy of features that LG hope will serve to make it a compelling alternative to what their biggest rivals are also offering in that hotly-contested LCD-LED space. In-lieu of the quantum dots found in their competition, LG have opted for a similar technology called Nano Cells. LG say Nano Cells delivers “breathtakingly vivid colors at wide viewing angles” - something that the company argue is a clear-cut advantage over the current crop of QLED options. Watching TV can often be a communal activity, and, while we’d all like to have that perfect living room setup, a TV that accounts for the variable angles that pop up in practice is an easier sell over one that hasn’t considered that side of the equation. The other advantage that LG’s Nano Cell solution seems to offer over quantum dots comes in the form of extended HDR compatibility. Yes, QLED TVs support HDR but they only support specific formats, and even then it’s usually just HDR10. With the SK85, LG are offering support for all three of the major standards: HDR10, HLG and Dolby Vision. Basically, if you’re looking for a LCD-LED option that’s as future-proofed as these things come when it comes to HDR support, the SK85 makes a compelling case for itself. If there’s anything specific worth praising here here, it’s the unwillingness to compromise - or at least compromise beyond the type of panel being used. Despite being about half the asking price of the company’s larger and flagship OLED options like the W8, the SK85 offers up software experience and featureset that’s more-or-less equivalent. 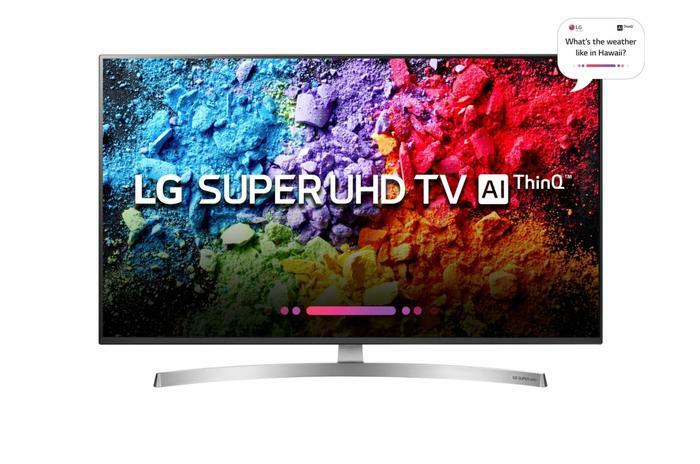 Like the company’s OLED range, it runs on their WebOS smart TV ecosystem and, like their latest OLEDs, it comes with full support for voice control via the company’s ThinQ AI natural language processing platform. For better or worse, the similarities between the experiences offered by this TV and the company’s OLEDs even extend to the negatives. Still, it’s easiest to tackle these two pillars of the SK85 experience one-at-a-time. WebOS itself continues to be a big of a mixed bag, even if the pros usually end up reluctantly outweighing the cons. On the upside, it’s remains one of the most coherent and mature smart TV platforms out there. Unfortunately, on the down-side, it still feels a little saddled by the Magic Remote. This piece of kit does have its fans but, to me at least, it feels like an accessory that manages to eke out the most frustrating kind of middle-ground compromise between the overwhelming AV remotes of the past and ultra-simplified “nu-remotes” of today. Still, in spite of these drawbacks, WebOS does also bring with it an impressive range of connectivity and compatibility to the fore. Out of the box, it supports Netflix, Stan, BigPond Movies, Google Play Movies, 9Now, Amazon Prime Video, Eros Now, Youtube, YuppTV, ABC iView, SBS OnDemand, MLB.TV and WOW TV. 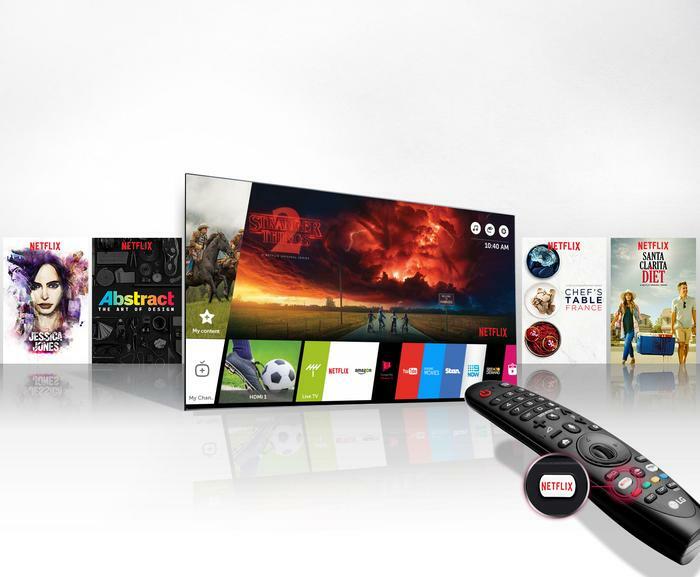 At a glance - it's hard to find fault in the extensive software library LG have assembled here, which is more than you can say about most Smart TV platforms. As with the company’s E8 OLED, LG are putting a larger emphasis on the smarts-side of the equation this time around. With their competition always gaining ground when it comes to picture quality, this is a smart bet. Nevertheless, the results shake out as a little disappointing. There’s lots of stuff you can do with the ThinQ voice controls here but not a huge amount of reasons to opt for it over the other options - and the fact that you have to trigger it manually using the microphone button on the remote further undercuts a lot of the potential efficiency the addition of voice controls could offer. Why press the microphone key, ask your TV to launch Netflix and wait for the TV to follow through when you could just circumvent the whole process by tapping the Netflix button on the remote? To LG’s credit, there is a reasonably lengthy list of things you can do with LG’s ThinQ natural language processing platform (which powers the voice controls) and, as far as these things go, it’s ability to understand what you’re saying is surprisingly-consistent. As with the E8, it’s not 100% perfect but generally it manages a pretty high-level of accuracy. As a result, using your voice to jump into or change specific settings like the volume, input source or picture mode works very well. Unfortunately, telling your TV to play anything more specific or tossing it a more advanced query usually just nets you a short list of vaguely-relevant Youtube content. 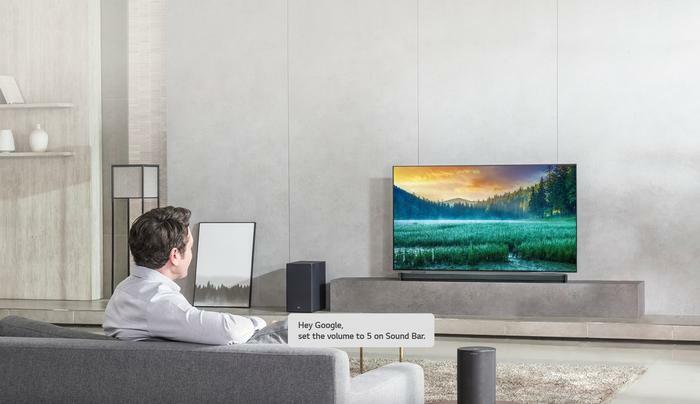 LG say that their 2018 range of TVs will be upgraded via software update to incorporate the Google Assistant later in the year. However, for now, they’re missing in action and the real-world value that these controls offer pales in comparison to what it could be with better integration to things like the Google Assistant or Amazon’s Alexa. In terms of the picture quality you get out of LG’s SK85 Super UHD TV, the results are impressive but familiar. Apart from the practical value of the wider viewing angles and the future proofing offered by Dolby Vision support, this is the typical 4K TV experience on offer here. Images look detailed, colors come across vibrant and contrast conveys a crisp sharpness , courtesy of the SK85’s a7 processor. 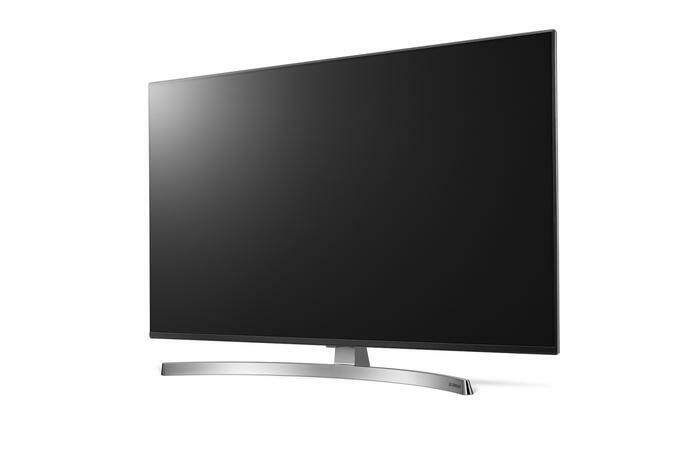 Since this isn’t an OLED, there’s no absolute blacks to speak of and it’s not quite as bright as Samsung’s QLED offering, but, as a 4K TV, the SK85 checks almost all the right boxes you’d want it to. When used to watch 4K Blu-rays like the HBO’s Westworld, the SK85 held up its end of the bargain and delivered results that were impressive but maybe not quite enviable as they would be on an OLED. Properly-mastered 4K content looked good, and often great on this TV - but it often looked good and great in the same way that most 4K HDR TVs look good and great. Upscaled HD content fared similarly. Given how much modern video content is still opting for HD over 4K, it’ll be interesting to see how much companies like LG invest in this area going forward. Most content is still releasing in HD and a lot of content will likely never make the jump to 4K - but it looked good on the SK85 nevertheless. Our time with the SK845 saw us binge-watch a dozen or so episodes of Battlestar Galactica and while LG’s upscaling can’t do much about the dated CGI or poor lighting, it improved the experience nevertheless. The intrinsic gulf between true 4K and upscaled-HD is still there, but it feels like it’s getting smaller in ways that matter. Still, going right into this one after reviewing LG’s W8 OLED, I definitely noticed the absence of absolute blacks. The SK85 also proved itself a solid performer when it come to 4K and HDR gaming content. 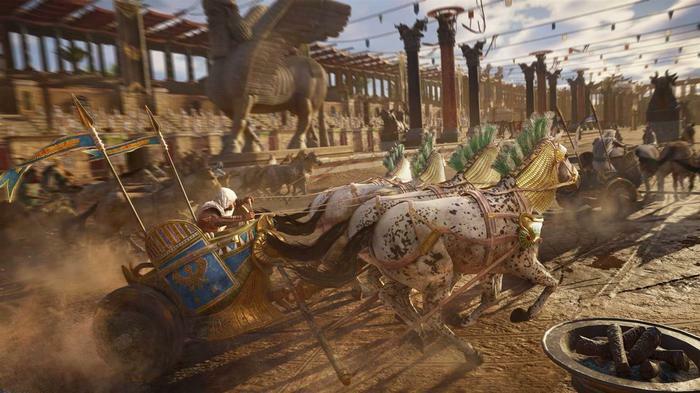 We sank about a dozen hours into revisiting last year’s Assassin’s Creed: Origins on this thing and came away really happy with the results. 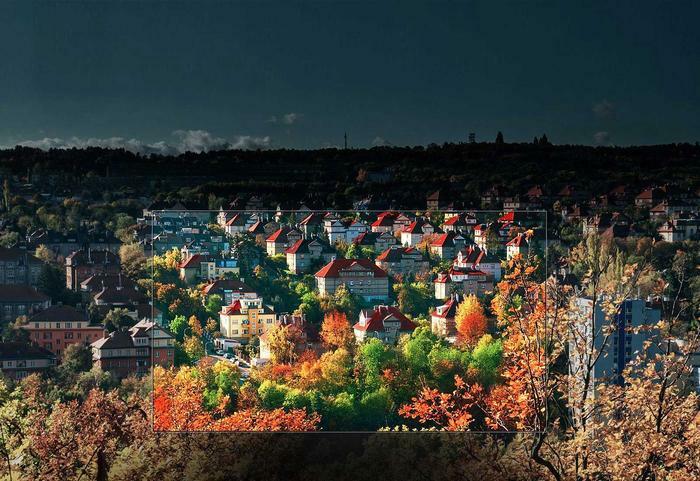 The game’s lush oases and cobbled cityscapes came through with enhanced color-depth and greater detail. The panoramic rewards bestowed upon those who climb the tallest structures in an Assassin’s Creed game have never looked quite this good. If there was any weakness worth highlighting here, aside from my mixed-feelings about WebOS, it’s the audio quality. Obviously, LG are hoping (and expecting) you to pair this one up with a soundbar - ideally, an LG one) - but, out of the box, we found the built-in speakers a little weak for our tastes. Dialogue was often overwhelmed by nearby ambient noise in our living room setup. Again, if you have a soundbar, this is a pretty solvable issue - but it is a notable weakness worth keeping track of if you don’t fancy being upsold on separate audio gear. There are plenty of reasons to buy a soundbar but there’s something that irks me about the vendors using the assumption that people will as a reason to justify a weaker out-of-the-box experience. 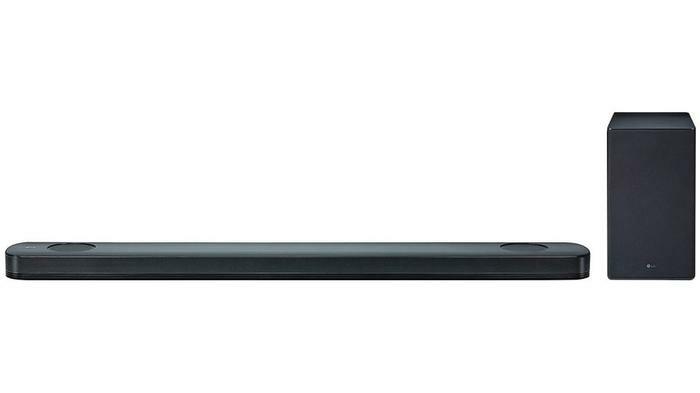 Speaking of soundbars, when it comes to LG’s SK9Y soundbar, it delivered the goods. If you’re looking for a natural companion to your shiny new SK85 Super UHD TV, you’ll find an easy and natural fit here. All the usual bells and whistles you’d expect from an LG soundbar are here and accounted for: 24-bit hi-res audio upscaling, 4K passthrough and built-in ChromeCast support. 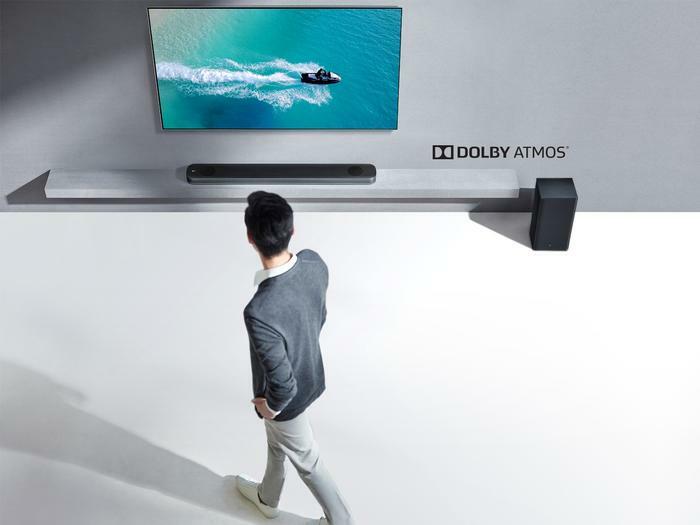 Unlike the SK10 we looked at alongside the E8 OLED, the the SK9Y doesn’t boast any custom tuning by Meridian but it does come with full Dolby Atmos support. Set up alongside the bundled subwoofer, the SK9Y sounds awesome in the most literal sense. It didn’t sound as good as the SK10Y but it sounded good. As with the former, you will probably have to mess around with the options to get the most out of it. 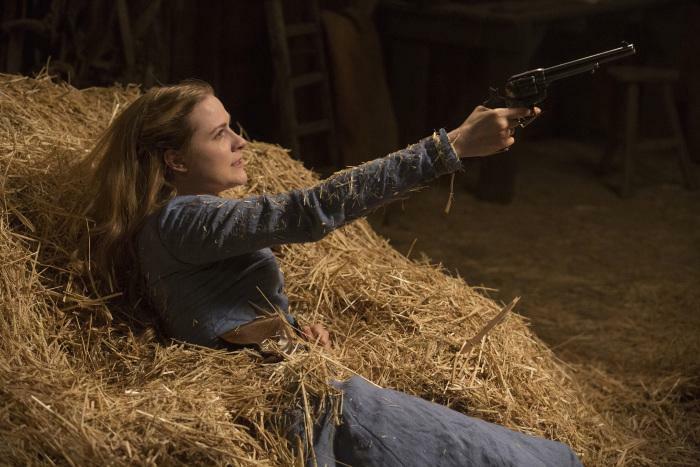 However, with that out of the way, it provided a ripe foundation upon which the Ramin Djawadi-composed soundtracks for both Battlestar Galactica and Westworld could build up their ambitious soundscapes. As with the SK10Y, the only major irk I have with the SK9Y is that I wish it could be more-easily manipulated using the ThinQ voice controls on the E8. Given what JBL is doing with their upcoming Link Bar, it would also be nice to see a version of this product that comes with on-board Google Assistant or Alexa integration. That said, a big part of the sell for LG’s ThinQ platform is that their products will get smarter over time, so that may yet change. If anything, the SK85 feel slightly-hamstrung by the fact that LG’s normal level of quality when it comes to TVs is so high. It’s great - but so are last year’s TVs, but so are this year’s OLEDs and so are a lot of the cheaper competition. This predicament isn’t helped by the reality of the company’s jump into AI and voice control, which is adequately integrated but doesn’t add quite enough value to hold its own as the magical or revolutionary addition as the marketing spins it as. Still, there is - all things considered - a lot to like here. 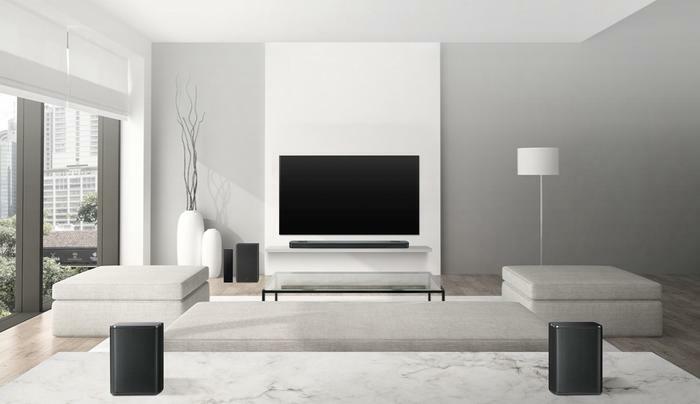 If you’re looking for a reliable 4K-option, a suite of practical bells and whistles make LG’s SK85 Super UHD TV and SK9Y soundbar a pair of products that are easy to recommend.